Saucy Greek Lemon Meatballs (Keftedes) a tangy meatball recipe that packs a punch! Meatballs are one of those foods that are pure comfort on the dinner table. Whether served over pasta, smothered in cheese on a sub roll, or forked straight out of a hot skillet, we never seem to tire of juicy little globes of meaty goodness. Today’s Saucy Greek Lemon Meatballs (Keftedes) recipe is a hybrid of greek flavors. Traditional keftedes are typically served on a meze appetizer plate with yogurt sauce, or with a tomato-based sauce and pasta. However another popular greek dish called Youvarlakia (a thick silky lemon soup with meatballs) also served as inspiration for this recipe. Although I like Youvarlakia, also called Giouvarlakia, I personally prefer less creamy lemon soup and more meatballs. 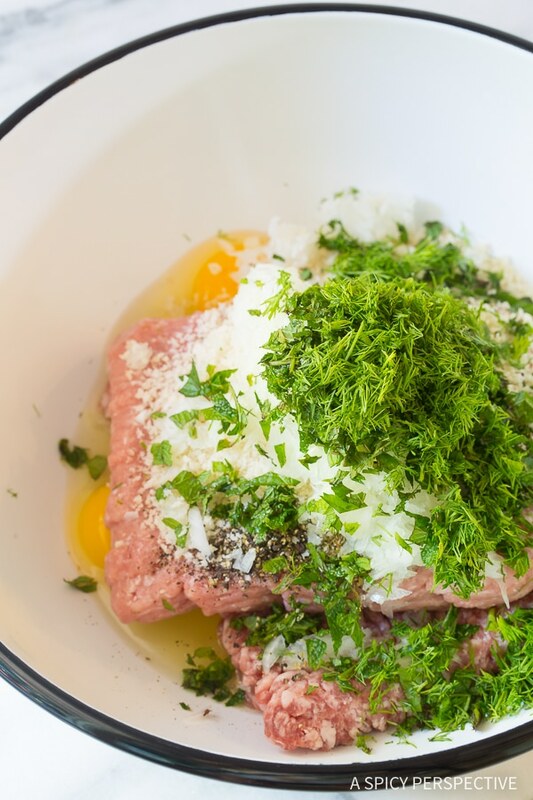 That’s why I turned it into a one-pot main dish or appetizer, Saucy Greek Lemon Meatballs, with the focus of the flavor and texture of the meat. 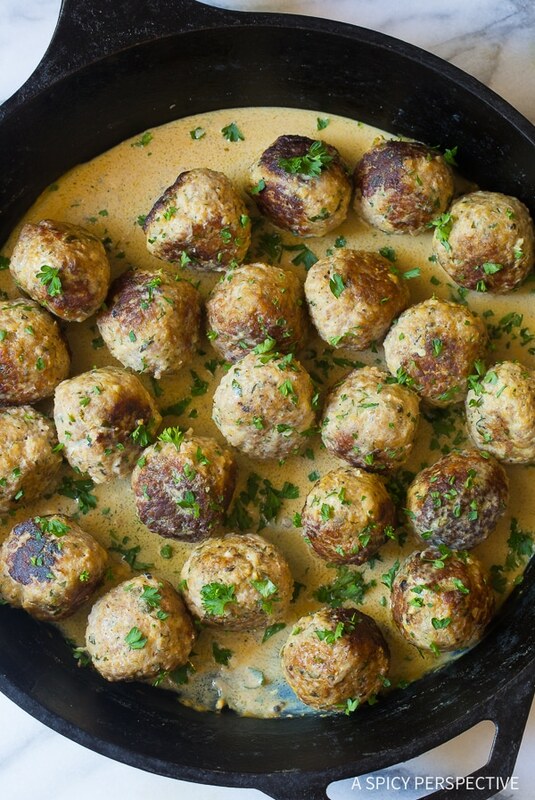 Saucy Greek Lemon Meatballs (Keftedes) make a fabulous mid-week meal. 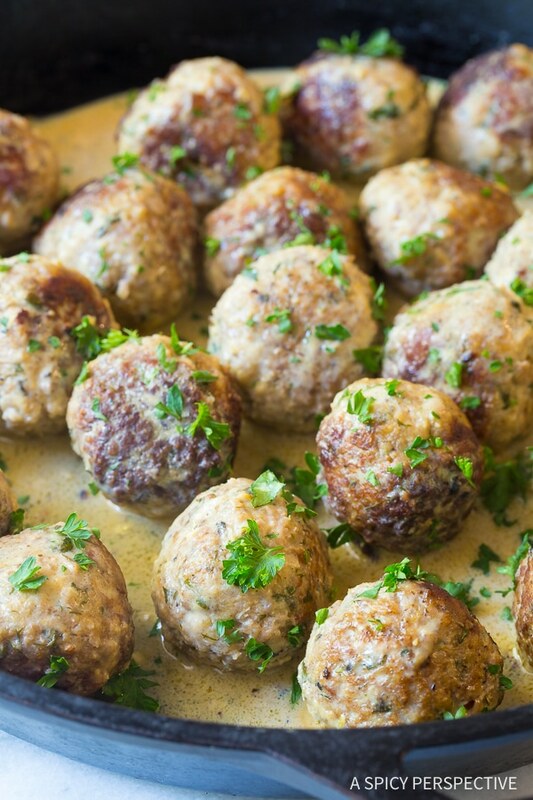 The lemon sauce is bold and vivacious, making these meatballs wonderful over pasta or rice. 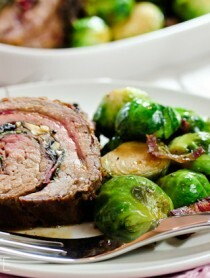 However, they are just as good as a lower carb meal with a big green salad on the side. The trick to making perfectly moist and juicy meatballs is to mix all the ingredients by hand, until very well combined. 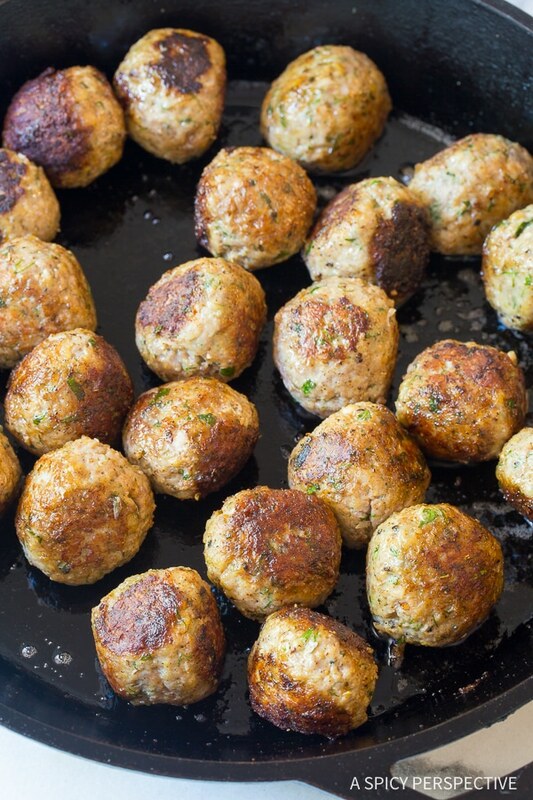 Any pockets of unmixed ground meat in the meatballs, will create tough uneven sections in the meatballs. 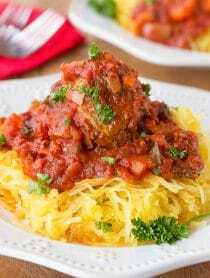 However, if you mix the meatballs thoroughly, the breadcrumbs, eggs, fresh herbs, and lemon zest offer a bright zesty flavor and a sumptuous delicate texture. Simmer these greek meatballs in silky lemon sauce and you have a true thing of beauty on your hands! Check out our video tutorial for Saucy Greek Lemon Meatballs (Keftedes) Recipe below. Saucy Greek Lemon Meatballs (Keftedes) Recipe - A tangy meatball recipe with bold flavors. The meatballs simmer in a lemon sauce that is fabulous over pasta or rice! Place the ground lamb and turkey in a large mixing bowl. Add the shaved onions, panko breadcrumbs, 2 eggs, chopped mint, chopped dill, Italian Seasoning, garlic powder, zest of 3 lemons, 1 1/2 teaspoons salt and 1/2 teaspoon ground pepper. Mix well by hand until the mixture is very smooth. 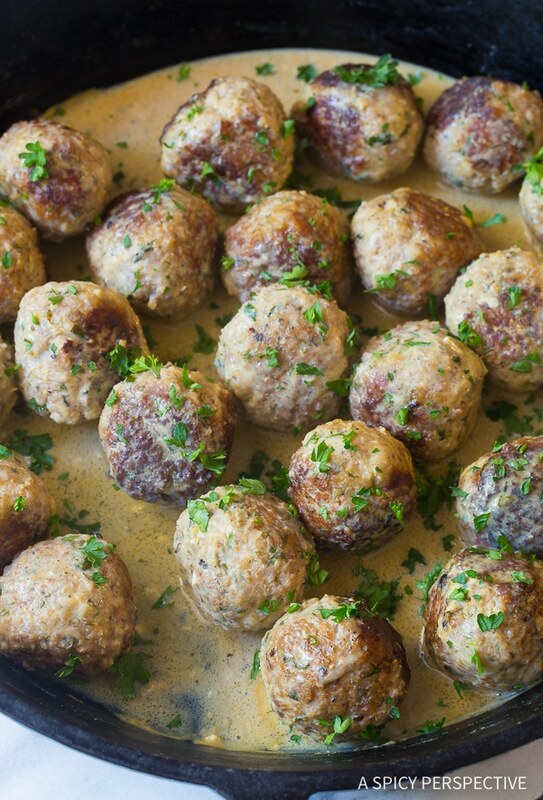 Use a 3-tablespoon scoop to portion out 24 meatballs. Roll the balls to pack tightly. Place a 14-inch saute pan over medium heat. Add the oil. Once hot, add the meatballs to the skillet. Brown the meatballs for 10 minutes, turning them every minute, to cook evenly. Meanwhile, whisk 1/3 cup lemon juice, 4 egg yolks, chicken broth, and 1/2 teaspoon salt together. Pour the mixture over the meatballs and simmer another 3-5 minutes to thick the sauce. Shake the pan gently to stir the sauce as it simmers. Serve warm. Yum! I’m going to make these this week. I might double the recipe and freeze some…do you think they’d freeze well?